It is odd to find a band that releases a self-titled album almost a decade into their career. 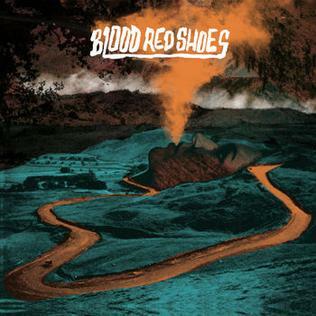 However, this is exactly what the Brighton-based stoner/indie-rock duo Blood Red Shoes with their fourth studio album, which they produced and engineered themselves. It is also been released on Jazz Life records, their own record company. The band welcomes back their fans with the opening instrumental track “Welcome Home”, and jump right into the rest of the album, with haunting vocals from both Laura-Mary Carter and Steven Ansell. Both musicians take turns singing some songs alone, or in the case of “Far Away”, Steven sings most of the song, with Laura-Mary joining in for the chorus. Compared to the last few albums, Blood Red Shoes has more of a fuzzy, DIY sound to it, probably because they recorded it in a concrete room alone in Kreuzberg, Germany over the course of 6 months. Many more of the songs on this album has the signature start of a BRS song; usually one of them starts singing with either guitar (by Laura-Mary) or drums (by Steven) and builds to the chorus where both will come in and rock out. This band’s sounds has grown, as well as going backwards with the movement of their career. They started off sounding very clean cut hard rock and on an established record label (Mercury Records), to this album, where they have jumped into more noise rock and a rougher sound, while releasing it on their own label. I’m certainly looking forward to their next endeavors.